Aerosol and clouds play important roles in determining the earth's climate, in ways that we are only beginning to comprehend. In conjunction with molecular scattering from gases, aerosol and clouds determine in part what fraction of solar radiation reaches the earth's surface, and what fraction of the longwave radiation from the earth escapes to space. 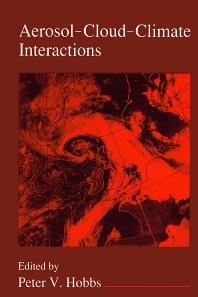 This book provides an overview of the latest research on atmospheric aerosol and clouds and their effects on global climate. Subjects reviewed include the direct and indirect effects of aerosol on climate, the radiative properties of clouds and their effects on the Earth's radiation balance, the incorporation of cloud effects in numerical weather prediction models, and stratospheric aerosol and clouds. Researchers and graduate students in atmospheric sciences, meteorology, and geophysics. PETER V. HOBBS was born in London in 1936. He received his doctorate from Imperial College, University of London, where he worked in the research group headed by Sir B. John Mason. He joined the Department of Atmospheric Sciences at the University of Washington in 1963, and served as a faculty member there until his death in 2005. In his role as founder and director of the the Cloud and Aerosol Research Group(CARG) in the department, he acquired and maintained a series of instrumented research aircraft with which he and his staff and students made field measurements of clouds, frontal systems and effluents from fires, volcanoes and industrial sources in many different parts of the world. He was a prolific writer and a devoted instructor and mentor of students. In recognition of his research and teaching contributions he was named an Honorary Member of the American Meteorological Society.